A mascot for the 2016 Olympics in Brazil has been shot dead after escaping its human captors Monday. 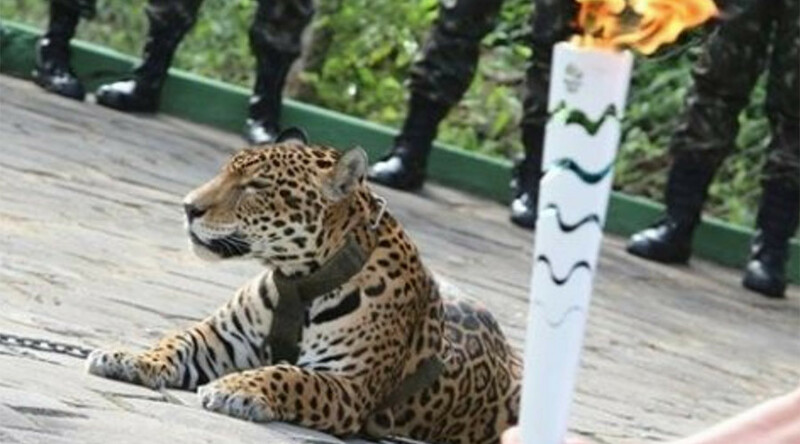 Juma the jaguar appeared in chains at a torch relay ceremony earlier that day in the city of Manaus. However, the feline was killed by a Brazilian soldier after breaking out of its cage at a zoo attached to a military training center, according to a statement from the army. Four tranquilizer darts had failed to stop the animal. The jaguar is the country’s national animal - and a yellow and green cartoon version of the big cat named Ginga is the Brazilian team’s Olympic mascot. Jaguar known as Juma, during the parade in Manaus, September, 7 2009. Organizers of a torch relay, where Juma was heavily guarded and surrounded by soldiers, admitted they were wrong to include the animal and guaranteed no such instances would occur again during Rio 2016. “We made a mistake in permitting the Olympic torch, a symbol of peace and unity, to be exhibited alongside a chained wild animal. This image goes against our beliefs and our values,” they said in a statement. The organizers now face an investigation from Ipaam, the environmental authority in Amazonas state which oversees the use of wild animals. They said in a statement that the use of Juma was illegal and that no request was made to authorize its use. PETA compared the killing of Juma to the gorilla Harambe who was shot dead last month after a four-year-old boy fell into its enclosure. In a statement, the animal rights group said the attempted escape by Juma should have been expected. “Wild animals held captive and forced to do things that are frightening, sometimes painful, and always unnatural are ticking time bombs - captivity puts animal and human lives at risk.” they said. The Olympics, which are due to begin in Rio de Janeiro in August, have faced a shaky start with controversies including high pollution levels in the city’s waters and a recommendation from scientists that the event be delayed due to the Zika virus. The world No.4 golfer, Ireland’s Rory McIlroy, announced on Wednesday that he won’t be participating in the event due to concerns over the Zika virus.